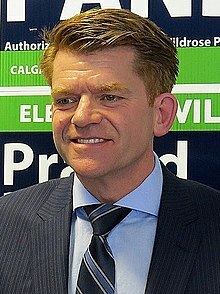 Brian Michael Jean (born February 3, 1963) is a Canadian politician who was the Leader of the Opposition of Alberta and the last leader of the Wildrose Party (2015-2017). He was a federal Member of Parliament who represented the riding of Athabasca from 2004 to 2006 and Fort McMurray—Athabasca from 2006 to 2014 in the House of Commons. After resigning from the House in 2014, he returned to political life in February 2015 by announcing he would seek the leadership of the Wildrose Party. He was elected party leader on March 28, 2015. In the 2015 provincial election, Jean was elected in the provincial riding of Fort McMurray-Conklin and became Leader of the Opposition as the Wildrose Party formed the Official Opposition to the governing Alberta New Democratic Party. Jean ceased to lead the Wildrose Party with the merger into the United Conservative Party and ran to be leader of the new party, losing to Jason Kenney. He resigned his seat in the Alberta legislature on March 5, 2018. Jean was born in Kelowna, British Columbia, and moved to Fort McMurray, Alberta when he was four years old in 1967. Jean has a Bachelor of Science degree from Warner Pacific College in Portland, Oregon, and Master of Business Administration and Bachelor of Laws degrees from Bond University in Gold Coast, Queensland, Australia. He also attended the law school at the University of Calgary, where he received qualification to be admitted to the Law Society of Alberta. This allowed him to practice law for 11 years in Fort McMurray prior to his political career. Jean has worked as a farmhand, a printer's assistant, a businessperson, a lawyer, and an inspirational speaker. In his community, Jean served as the chairman of the Children's Health Foundation in Northern Alberta, chair of the Alberta Summer Games, president of the Fort McMurray Downtown Business Association, and director of the Fort McMurray Chamber of Commerce. Jean was first elected to the House of Commons as a Conservative Party of Canada candidate in the riding of Athabasca in 2004, sitting in the Official Opposition to Paul Martin's Liberal government. He was re-elected in the renamed riding of Fort McMurray—Athabasca in 2006, when the Conservatives formed government under Stephen Harper. In February 2006, Jean was appointed Parliamentary Secretary to Minister of Transport, Infrastructure and Communities Lawrence Cannon. Jean was re-elected again in 2008 and 2011. After the 2011 election, he declined reappointment as Parliamentary Secretary in order to focus on his constituency needs. In the House of Commons, Jean served on the Finance, Justice, and Industry Committees. On January 10, 2014, Jean announced that he would be resigning his seat on January 17, 2014 to return to private life in Fort McMurray. The Wildrose Party was in disarray in late 2014 after leader Danielle Smith and eight other MLAs crossed the floor to the ruling Progressive Conservative Association of Alberta. A leadership election was organized to choose a new leader and Jean was encouraged to run. Jean entered the race on February 25, 2015, and was elected party leader on March 28, 2015 with 55% of the vote, defeating Cypress-Medicine Hat MLA Drew Barnes and former Strathcona County Mayor Linda Osinchuk. The 2015 Alberta election was held on May 5, 2015, less than two months after Jean became Wildrose leader. The party retained its standing as Official Opposition in the legislature, growing its caucus from 17 in 2012, and 5 at dissolution, to 21. For the first time in Alberta history, the New Democratic Party formed government, with Rachel Notley becoming Premier. This marked the end of 43 years of government by the Progressive Conservatives. On August 30, 2016 Jean, responding to questions about the need for more seniors housing in the city he represents, told an audience he has been "beating this drum" for more than a decade. "I will continue to beat it, I promise," Jean said. "But it's against the law to beat Rachel Notley." He quickly apologized for what he later characterized as an "inappropriate attempt" at humour. Jean's former federal caucus colleague Jason Kenney became Progressive Conservative leader after winning that party's leadership election in early 2017. Kenney's platform called for uniting the Progressive Conservative and Wildrose parties to form a united right-of-centre alliance. On March 20, 2017, Jean met with Kenney to begin unity discussions. On May 18, 2017, Jean and Kenney announced that their two parties had come to a merger agreement and on July 22, 2017 the merger was passed with 95% support from both the PCs and the Wildrose. The merger agreement formed the United Conservative Party, a leadership election occurred on October 28, 2017, in which Jean was defeated by Kenney, and a founding convention to be held in 2018. Jean announced his resignation from the legislature on March 5, 2018, saying he wished to spend more time with his family and rebuild his house which had been destroyed in the 2016 Fort McMurray Wildfire. ^ "Brian Jean enters Wildrose leadership race". Calgary Herald. February 25, 2015. Retrieved March 18, 2015. ^ "Brian Jean brings Wildrose back to respectability". Globe and Mail. May 5, 2015. Retrieved May 6, 2015. ^ "Alberta Conservative MP Brian Jean stepping down". CBC News. January 10, 2014. Retrieved January 10, 2014. ^ "Conservative MP representing oil sands resigns". Globe and Mail. January 10, 2014. Retrieved January 10, 2014. ^ "Brian Jean, Jason Kenney take first steps toward uniting Alberta conservative parties". CBC News. Retrieved 2017-04-19.